Added on March 12, 2017 by Stella Chapman. Salt were among a group of female professionals invited by a young women's project, Bossy Girls to advise on creating a poster campaign to celebrate International Women's Day. Along with Nichola from Word It, we joined the group of women aged 15 to 23 at one of their workshops at the Quarterhouse, Folkestone. Led by founder member Emma Westbrook, the team had created a room full of impressive sketches, visuals and slogans for the campaign based on issues important to them – grouped into the themes of sexual harassment, media representation of women and gender roles. We helped select a concept they could develop into a public installation to appear in various locations in Folkestone. One idea stood out instantly and told their story of what it's like being a young woman today in one clear message – 'Being a girl is not a crime'. Emma explained "The result (of the workshops) has been an overwhelming feeling that women and girls are often made to feel that they are being punished for simply being themselves." 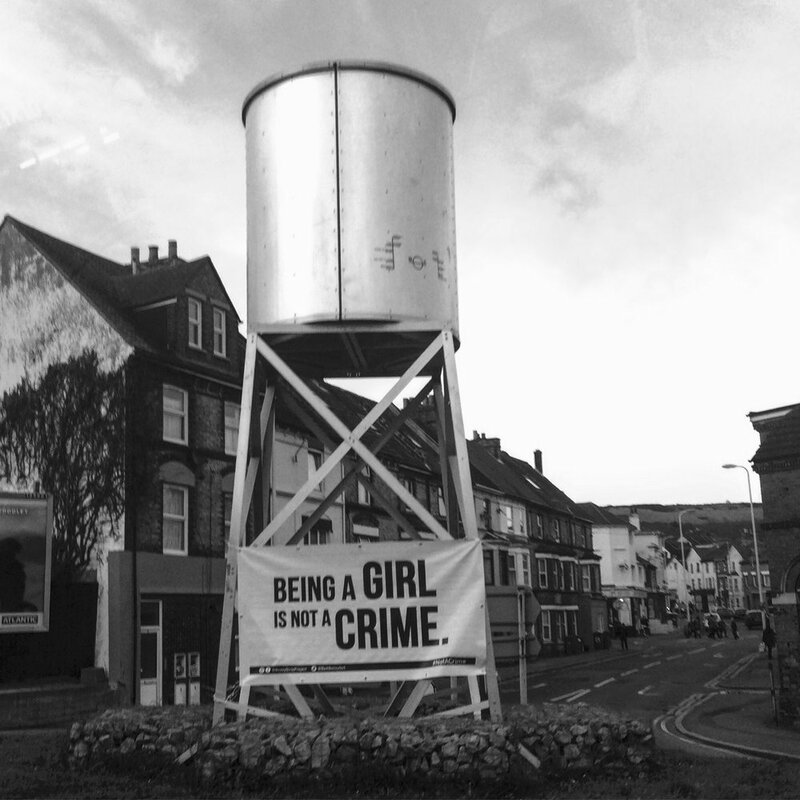 The posters and banners popped up guerrilla style around central Folkestone last Sunday morning, designed to create intrigue among the general public and resonate with local young women. We were delighted to see they demonstrated great restraint in the design using bold black type, free of embellishment or any obvious expression of the feminine. It captured the spirit of the International Women's Day theme 'Be Bold for Change' perfectly. The hashtag #NotACrime was used to encourage engagement during International Women's Day and beyond. Following the project's success, the 'Bossy Girls' aim to have regular meetings and workshops across different areas. The posters are available from Folkestone Quarterhouse Box Office this week. Emma said: The Boss(y) Girls Project came about after the WOW (Women of the World) Festival at Folkestone Quarterhouse last year (2016) and has been heavily supported by them and Folkestone Fringe throughout. The name was inspired by Beyoncé's quote, "I'm not bossy… I'm the boss." and was designed to address the double standard that girls were seen as bossy and fussy when they were assertive, but boys were seen as strong and having good leadership skills." The core team were Chelsey 17, Livvy 17, Josie 19, Chani, 23, and Emma Westbrook, 18. For more information visit the Bossy Girls Facebook page.